SO SIMPLE - USE JUST LIKE A NORMAL TEXTA! Edible Ink Markers are perfect for decorating all of your edible treats. Write and draw on any food surface firm enough to write on, such as ­ Rolled Fondant, Royal Icing, Marzipan, Donuts, Cookies, Gum Paste, Pastries, Wafer/Rice Paper. Perfect for stenciling, stamping or using freehand. Also a great idea for the kids to get in on the decorative fun and draw something unique! With a thick and thin tip end, it allows for general drawing use and finer details. 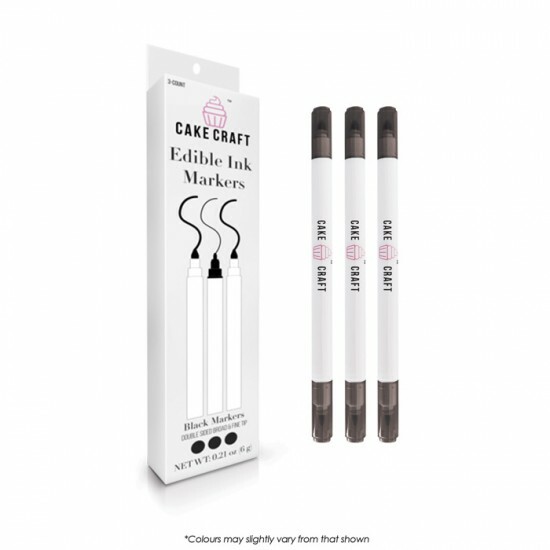 Sugar Crafty Edible Ink Markers Set 1Perfect to write and draw on cakes, cookies, macarons, meringues and more. Includes 1 of each pen colour: ye..
No need to grease and flour your baking pan - Cake Release coats in one step. Simply spread Cake Release lightly on pan bottom and sides with a pastry..
4" Round Acrylic Cake BoardCake Warehouse's own acrylic boards, these boards are perfect for perfect ganache and buttercream application to create str..